How can SecureForm Help You? Russell and the LuxSci team have been phenomenal to work with and provide an excellent solution to the security needs of the electronic world. Their customer service was top notch, consistently offering quick and professional responses to our questions and requests. Our project required creative solutions to meet our specific needs. LuxSci consistently exceeded our expectations. I fully recommend them to anyone looking for electronic security solutions." Use our web interface to configure what happens to the data that is submitted via your form. There are a variety of options available, allowing you to totally customize how your forms behave and how the data is processed. Use Form Builder to visually create your form. You design your own web site forms and/or PDF forms. Use our web interface to configure what happens to the data that is submitted via your forms. Point your form to the web address that we provide to you. A user visits your web site and fills out your web form. When they have completed filling out the form, they press the "Submit" button. The data they entered is sent to LuxSci via the secure web address we provide to you. If the data is sent successfully, the visitor is redirected to a "Success" page on your web site. If the data could not be sent successfully, the visitor is redirected to a "Failure" page on your web site instead. Note that this process is always the same regardless of where your web site is hosted. Also, unless your web form is misconfigured, the visitor will never be redirected from your web site and will always see your URLs in the address bar. With web site forms, the submission process to LuxSci's servers is always fully transparent to the user. The user opens your PDF file and fills out the form. The data they entered is sent to LuxSci via the secure endpoint web address we provide to you. For PDFs, the user may be prompted to first confirm that they trust the address to where the form data is being sent. On success, the user is shown your custom "Success PDF". On failure, the user is shown your custom "Failure PDF". Where would you like your data to be saved or sent? Database. Instead of a file, have your data uploaded directly to a MySQL database. Access that data online through our reporting tools. Document Storage. Store your file in LuxSci Documents, part of our WebAidesTM collaboration suite. Email. Send the form data and files to you via regular or secure email. Send to any email address/multiple email addresses. FTP/SFTP Server. Have your data uploaded to any web server via FTP or SFTP. Notice. Send a simple post notification via Email, SMS/text message, SecureChat. SecureChat/Mediprocity. Send the form data and files directly to your mobile device or desktop using our real-time SecureChat service. Dropbox. Send form data and files to your Dropbox account. Slack. Send a custom data-laden message to any Slack channel. Webhook. Send a to any third-party service that supports inbound JSON or URL-encoded Webhooks. What formats would you like your saved/sent data in? Some Integrations (e.g. WebHook) come with their own special data format customization options. Plain text. Receive your data as a raw text file. Tabular HTML. A nicely formatted, two-column HTML view of the form fields and data. XML Simple, automatically-created XML document. PDF. Receive your data as a complete FDF or PDF file, or as a refilled PDF template file. Text/HTML Template. Receive your data as a refilled template file in text, HTML, XML, or any other text-based file format. CSV. Receive your data as a CSV (Comma Separated Values) file to be viewed in programs such as Microsoft Excel. SecureForm services can also be an upgrade/add-on for customers with existing Secure Email or Secure Hosting accounts. 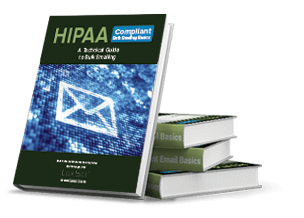 HIPAA compliance is available for all SecureForm accounts except the 3-form shared options. PDFs are hosted in Amazon AWS and are made available through Amazon CloudFront. LuxSci's services are provided on servers located in USA-based data centers (RackSpace or Amazon). *Business Class dedicated servers can be provisioned in RackSpace and Amazon data centers around the world if requested by the customer. There may be an additional setup fee for a non-standard location. Enterprise class servers and Business Class servers at RackSpace enjoy software firewalls and redundant HA hardware firewalls. Business Class servers at Amazon enjoy software firewalls and AWS Security Group logical network firewalls. Standard backups of your server data are included. These include 7 daily on-site backups and 4 weekly off-site backups. *Business Class dedicated servers from RackSpace, used for large-scale emailing only have full disk encryption if requested by the customer. This will require ordering a separate disk. Dedicated SecureForm Processing requires a dedicated server with Private Labeling. When ordering shared SecureForm services, SecureForms are processed through a shared Enterprise Class cluster and your data is saved on a shared Business Class or Enterprise Class server. Dedicated solutions are ideal for isolating both your data and the processing of your data from everyone else. Dedicated SecureForm Processing servers require servers with a minimum of 2 CPU cores and 4 GB of memory. Dedicated server customers can choose custom backup frequencies and retention schedules; this may come with an additional cost. Contact sales for more information. Business Class servers are single virtual servers running in the RackSpace or Amazon Public cloud. Enterprise Class servers are VMWare virtual servers running on a redundant cluster of servers in LuxSci's Private Cloud at RackSpace. Account Isolation: No other LuxSci customers have access to your server. No shared servers. In a shared solution, many 100s or 1000s of separate customers share the same server. Security replies on logical and software partitioning of access and resources. Shared solutions are inherently less secure, have less consistent performance, but are less expensive. Dedicated servers are recommended for when security and consistent performance are important. Enterprise Class servers are virtual machines that run on a redundant VMWare cluster. If one of the underlying hypervisors should have a hardware issue, all servers running on it are immediately rebooted on another hypervisor, limiting potential downtime to seconds. Choose Enterprise Class when server uptime is a very high priority. Server Isolation: All servers running on the same hardware belong to LuxSci. No public cloud servers. In the Business Class environment, your server is in a Public Cloud. This means that other servers running on the same underlying hardware (hypervisor) may be owned by organizations unrelated to LuxSci. This provides some security risk compared to use of LuxSci's Private Cloud Enterprise Class environment, where LuxSci owns the underlying hardware and is in control of all servers running on it. 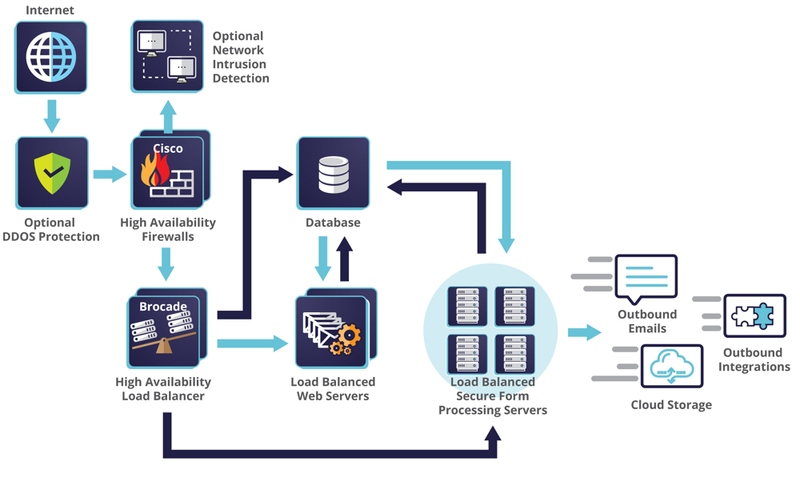 Additionally, the Business Class environment may have less consistent performance due to the possibility of "noisy neighbor" servers outside of LuxSci's control. Private Label branding is optional on shared accounts. It starts at $25/mo. Private Label branding is required for dedicated SecureForm processing servers and is thus included in the "Starting Price" listed below. On dedicated SecureForm processing servers, we can customize your maximum form post size limit. If a custom solution might be right for you, contact sales. Can I use my own forms? Yes. SecureForm integrates with any web or PDF form hosted anywhere. A few minutes is all that it takes to update an existing form to send its data to SecureForm for processing and delivery or storage. Do I need to host my web site with LuxSci to use SecureForm? No. You can keep your web site where it is and either integrate its existing forms with SecureForm, or link your site to forms saved in SecureForm FormBuilder. What format can I get the form data in? SecureForm will transmit or save your form data in any combination of formats: plain text, two-column HTML, CSV (Excel), XML, refilled custom templates (HTML, XML, or other), and re-filled PDF templates (even with the data from web form submissions). Where does the form data go? SecureForm can transmit or save your form data to many different locations (Integrations). See: "How SecureForm Works". Do I get a trustmark or seal for my website? Do you make or design the forms for me? We do not make your forms. You or your web designer can modify your existing forms, make new forms hosted elsewhere, or use SecureForm visual form builder to make and host new forms. We do provide custom consulting services for form design. This is $250/hour. Do you migrate my existing forms to FormBuilder? We do not manage or migrate your forms. You or your web designer can migrate your existing forms, make new forms hosted elsewhere, or use SecureForm visual form builder to make and host new forms. Do I have to know how to program? You don't need programming skills when using the SecureForm visual form builder or PDF forms. When designing or updating your existing/external web forms, you or your web designer will have to edit a couple of lines of HTML code to direct the form submissions to SecureForm; if a content management system such as Gravity Forms for Wordpress generates or dynamically manages your forms, then you may need a little coding to integrate SecureForm. How many forms or submissions can I have? For larger limits, please contact sales. How secure are the forms? Encrypted Email: The data can be sent encrypted using PGP, S/MIME, Forced TLS, or via Escrow secure Web pickup. SecureChat: You can send form data to recipients securely using our SecureChat real-time communication and collaboration system. These messages are AES-256-encrypted at rest and encrypted via TLS during transmission. Secure FTP: You can upload data and files to your server using Secure FTP and a strong cipher like AES 256. Once the files are there, their security is up to you. MySQL Database: You can save your form data to a database and you have the option of having all files and data encrypted at rest with native AES encryption. WebAide File Storage: You can save your form data to our WebAide Documents collaborative online file storage system. You can choose to have this data be automatically and seamlessly PGP-encrypted. WebHook Integrations: Data can be translated securely (over TLS) to external services using WebHooks. You do not need your own TLS certificate to use SecureForm; however, if you are hosting your forms on your own website, we do recommend that you secure that site with TLS to protect your form pages themselves from alteration/hacking before getting to your end users. What kinds of reports do you have? SecureForm includes detailed reports of all successful form posts, and of many kinds of post failures (including emailed alerts of important types of failures). If saving your data to a hosted database, SecureForm provides an audit trail of views and deletions (if such are permitted) of all rows of posted data accessed via our API or or Web-based Form Database viewer. Yes. Users of your web-based forms can sign a written signature using their mouse, stylus, or finger, and it's possible to capture and deliver that signature along with your form post. The post can even auto-append to refilled PDF templates or inserted inline in refilled HTML templates. See Ink Signatures. Does SecureForm have an API? Yes. SecureForm has an API that allows listing, downloading, and optional deletion of SecureForm data stored to a hosted database. Can I use my own URL for branding/white labeling SecureForm? Yes. You can order Private Labeling and then customize all URLs so that LuxSci's domain names are not visible anywhere. You will also need to buy your own TLS certificate or purchase one from LuxSci. LuxSci SecureForm is full-featured, regardless of where your email or website is hosted. For each of your PDF SecureForm configurations, you can upload the PDF form that goes with it. We will host this file for you and provide you with a secure link that you can use to access it. SecureForm uses ClamAV (which is updated hourly) to scan all uploaded files. Any form submissions with suspect files will be rejected. Optional per-IP address rate limits; cut-off IP address(es) if limit exceeded over 24 hours. You supply links to your own success and failure web pages; the end user is shown these once the form posting completes. For PDF forms, you supply your own success and failure PDF documents to be displayed to the end user once the form post is complete. You can upload a PDF to show on successful form submission and, optionally, one to display on failure. The success PDF can be a "template" so that form data can be re-filled back into it before it is sent back to the user. This allows you to either give the user a copy of the completed form or a personalized success page. Ink Signatures: Capture hand written signatures in web forms. Supports up to 25 files & 50 MB of data in each form post. All posted files are automatically scanned for viruses; posts with viruses are rejected. Auto-detecting and handling any kind of submission failure. Continuing operation on the same page after the form post is complete (e.g. after re-drawing part of the page). Any situation where you do not want to navigate away from the current page. Dynamically name refilled template files with field values and time/date stamps. When using PDF or text template files, you can specify rules for file name creation so that each post can have a different or unique name. You can insert date and time data as well as content from the form post itself. You provide a Template (PDF or other format) and SecureForm refills it and saves that temporarily. SecureForm passes a link to your "Success" web form page; you display that link to your end user (the "Success" page must be dynamic and not plain HTML). The end user has one hour to download that file. Only someone at the end-user's IP Address uses this special download link. Compatible with Ink Signatures -- the signatures will be appended to PDF templates. Note that you must have the ability to program your web form success page so that it can read the passed web address and display that to the end user as a link. This feature only works with Web Forms. Use enforced TLS Only, SecureLineTM Escrow, or PGP, or S/MIME encryption for secure email messages. Forced TLS and Escrow options requires a SecureLineTM license. Bring your own PGP or S/MIME certificate or have us generate one for you. SecureLineTM can look at the value submitted in a specified form field to find the email address to which to send your form data. This email can be secured with SecureLineTM Escrow, no matter what the address is. Upload a PDF form and have the submitted data re-filled into the form fields and saved either as an editable or not-editable PDF. A file with place holders that are replaced with your form data on submission. This file could be HTML, XML, or any other textual format. HTML Templates can be auto-converted to PDF for you. Collaborate on, annotate, and archive each post message. MySQL storage is automated so that no special database setup or maintenance is needed and it works with any web or PDF form. Changes to your form fields are automatically reflected in the MySQL database, with no work required by you. Encryption at rest for MySQL-saved form posts. You can optionally choose to have your MySQL-saved form data encrypted cell-by-cell using native-MySQL AES encryption commands using an encryption key unique to your form which is not saved in plain text anywhere on LuxSci. Use our "Online reporting tools" to view the encrypted data, or connect directly to your database and use MySQL AES_DECRYPT commands, together with your key, to access the data on demand. Online reporting tools: Optionally permit deletion of post data. Online reporting tools: Access to and deletion of your MySQL-saved form data is audited. API Access to MySQL-saved form data. Optionally have form data, and all files uploaded, saved to a Documents WebAide — LuxSci's file storage service. These WebAidesTM are backed up daily and we provide free restores. The data saved to these WebAidesTM can be accessed securely any time from any Web Browser. Export a combined CSV file containing all the data from any selected set of stored CSV data files. Encryption: The data saved to these WebAidesTM can be optionally PGP-encrypted so that the data is secure while stored and so that you are the only one with access to the raw form data. LuxSci's web interface can generate PGP keys for you. If you are saving SecureForm data to a hosted database, you can use our API to query this database, download rows and files, and delete rows and files. The API functions make it easy to discover what posts are new or happened in a specific time frame, and to synchronize post data with your own external systems. Email, Securechat, and text message notices of each form post, sent up to 10 recipients. Specify custom 'From' addresses and dynamic subject lines in notification messages. View and download detailed logs of successful form posts (IP address of user, time, secure or insecure?) and of failed posts. When operating your website or database, you need to ensure that all sensitive client or patient information is secure and protected from unapproved eyes. This means using secure web forms. Unsecured forms and legal documents can provide easy access for hackers to infiltrate and collect confidential information, which is why LuxSci developed a secure web form solution. 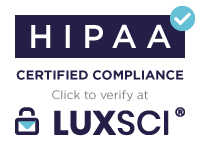 LuxSci's SecureForm processing allows you to add and store HIPAA- (Health Insurance Portability and Accountability Act) compliant patient forms, tax documents, legal forms, etc., in order to ensure your online services stay protected and legal. SecureForm seamlessly integrates with any of your company's current web or PDF forms. SecureForm is compatible with any CMS (including WordPress), as well as custom-coded pages made using PHP, .NET, and any other language. You can save your data in multiple formats: plain text, two-column html, CSV (Excel), XML, refilled custom templates (HTML, XML, or other), and refilled PDF templates (even with data from Web forms). Our SecureForm FormBuilder allows you to use our web interface to configure and customize your own forms without any coding knowledge. SecureForm ensures that your data remains protected during transmission, using TLS encryption, and at rest, using PGP and/or AES encryption. Note: if you are a LuxSci HIPAA customer, SecureForm automatically configures for your compliance. One of our exciting HIPAA-compliant SecureForm features is Ink Signatures. LuxSci's Ink Signatures are simple web-based agreement boxes that allow you to easily capture the authentic handwritten signatures of anyone filling out a SecureForm-enabled web form. There's no special software or technical knowledge required; you can sign with a mouse, a stylus, or a touchscreen. This user-friendly feature provides an easy way to establish signed agreements and is much easier to implement than standard digital signatures. Book 5 in the LuxSci Internet Security Series.